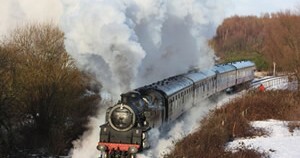 Join hundreds of visitors on December 30th and 31st and travel on one of the last steam trains in Scotland this year! A nostalgic steam train journey in a cosy carriage, complimentary hot drink and a slice of traditional Hogmanay black bun for the adults and shortbread and juice for the kids will make a perfect family treat to end the year together in style at this unique event. DON’T MISS THIS – subject to weather conditions, the Museum of Scottish Railways will be open 11am until 3pm (last admission 2.30pm).